The art of flower arranging gets plenty of attention this weekend as the 51st Ikebana Flower Exhibition and 50th Anniversary Celebration demonstrates the art this weekend. The three-day event hosted by Ikebana International Okinawa Chapter #10 takes place at Okinawa Mitsukoshi Department Store on Kokusai Street in downtown Naha City, beginning on Saturday. A series of ceremonies, ribbon cutting and candle lighting begin at 9:30 a.m., with Kevin K. Maher, the American Consul General, and Special Ambassador Tadashi Imai participating. 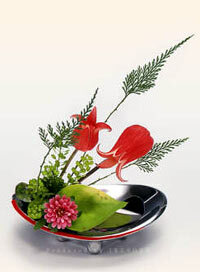 Ikebana, the Japanese art of flower arrangement, is more than merely putting flowers in a container for display. As Elizabeth Biddle explains it, “it is a disciplined art form in which the arrangement is a living thing in which nature and humanity are brought together.” Biddle says Ikebana is “an art like painting, calligraphy, sculpture and bonsai arts.” Ikebana historically has specific principles and theories requiring highly developed technical skills and creativity. Marine Corps Community Services will conduct a tour on Saturday from 1 ~ 6 p.m. to the flower exhibition. The tour begins at 11:15 a.m. at Mitsukoshi Department Store, traveling to Kinser Surfside for a luncheon, then to Major General and Mrs. Robert E. Schmidle’s home to view Ikebana. The tour later returns to Mitsukoshi. Events at Mitsukoshi through the weekend take place on the 6th floor. There will also be a tree planting Sunday at the New Art Museum, and a Golden Anniversary Celebration Banquet Sunday evening at the Royal Orion Hotel. During the flower exhibition, participants will use Okinawan art objects such as lacquer ware and Okinawan pottery techniques inherited from the Ryukyu dynasty. There will also be Ryukyu glass demonstrations, an art spawned after World War II when artists used recycled Coca Cola bottles to create beautiful glass objects. More than 140 members will display their Ikebana art. All will be using containers made on Okinawa to highlight the beauty in arts of pottery, glass and lacquer ware on the island.